Assignment 4 was a fun assignment, the first opportunity to use a lot of colour after the first two graphite assignments and then all the greens in Assignment 3. Choosing which flowers to use was really tricky for me. I’m lucky that my Mum’s garden is beautiful, and so I had a lot of choice there, but I also made a couple of trips to the best nursery near me for some inspiration… It was such a hard decision! I was actually quite unhappy with the outcome though – I felt like I could have done a lot better, and this wasn’t at all my best work. She commented that I needed more highlights on the rose, and perhaps a very pale wash of cobalt blue could have helped with that. She also noticed that I tried to lift paint to give the highlight, whereas it would have been better to leave it white from the beginning, something I do normally do (see the Platycodon below). She mentioned that if I was to do the same rose again, then using some Permanent Rose would have given it more of a ‘glow’. Her final comment was that I should make my first wash as bright as possible, as adding layer after layer can be ‘deadening’. 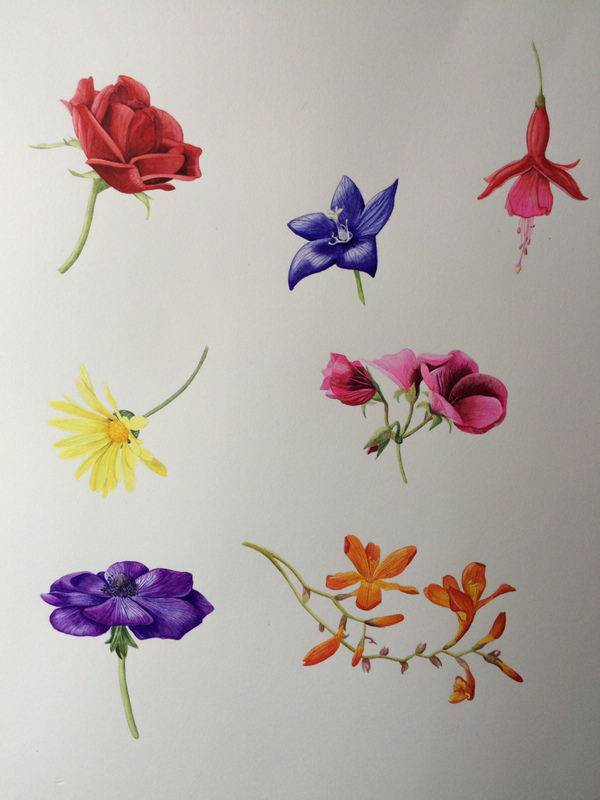 I loved painting the platycodon… I got to use one of my favourite colour paints ‘Blue Violet’ from Sennelier. I really used this as an opportunity to play with tone, and really emphasised the highlights on the petals. The best way to do this, as mentioned above, is to leave as much of the highlight completely free of paint on the first layer of wash. Then following washes you're more likely to retain that highlight. I feel like this fuchsia could have gone better. I painted this late at night when I was very tired (a lesson to be learnt there). I did think I got the colours right, but I felt I could have painted it more delicately. 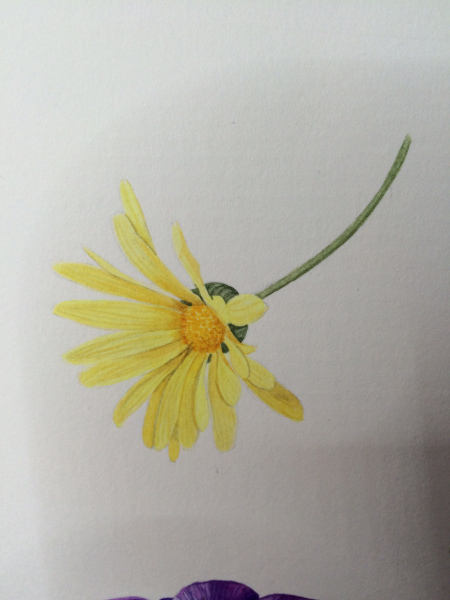 I knew I needed a pop of yellow on the page and this daisy was perfect. Painting yellow flowers well takes practice, this was my first attempt (I always shy away from them normally). I think they require a similar process to painting white flowers (particularly the use of botanical greys). My tutor correctly pointed out that at this angle, the centre of this argyranthemum would be more oval. 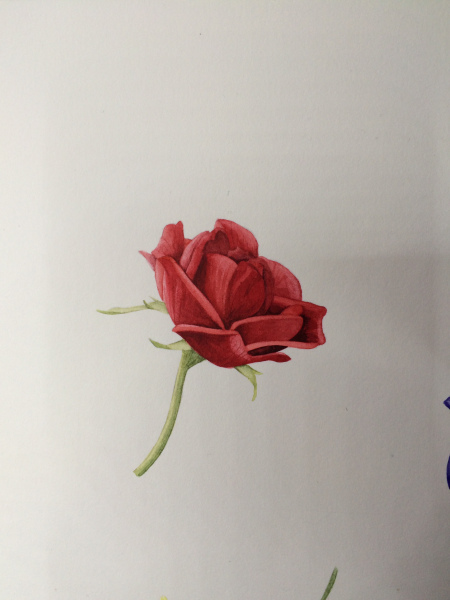 There definitely could be a darker tone to the right hand side of the stems, to emphasise the light source. I love the pop of orange colour this Crocosmia gives to the page. My Mum’s garden has a lot of Crocosmia, and I’ve always looked at it but never seen it. It’s so beautiful, even once the flowers have fallen off, the shells and structure of the plant is so unique. I love anemone's. The contrast of the dark centre and bright petals are stunning. I got to use Blue Violet again for this anemone, with some Indanthrone Blue (Daniel Smith) and Opera Rose (W&N). I somehow managed to get 8. 88 as a final mark for this assignment, which I genuinely thought was over-generous! I'm looking forward to the next piece, I feel as though I've learnt a huge amount on this one.